Pork ribs are among the most popular meats to barbecue and the one that gives many people the most trouble. If you have a smoker and know how to use it, you shouldn't have any difficulty. If, however, you are using a charcoal grill then you need to learn how to keep it low and slow to get tender, perfect BBQ ribs. Let's go through some simple steps and you will be "grilling" the best ribs you've ever eaten. The biggest problem with grilling ribs on a grill is getting a good smoke flavor. What we are going to do is turn your full-sized charcoal grill into a small smoker. You will need the ability to control your grill's temperature in order to hold it around 250 F/120 C. Only half the cooking surface of the grill is used cooking the ribs indirectly, low and slow without burning or drying them out. Here's everything you will need to learn how to cook ribs on a charcoal grill. This method can be used with spareribs or baby back ribs. Spareribs are meatier and will take about 4 to 5 hours depending on your grill. Baby back ribs will take between 3 to 4 hours to cook. Simply taking the ribs out of the package and throwing them on the grill won't produce a lot of flavor, especially if the rib membrane is left on. Some people say that if you are grilling the ribs, you don't need to remove the membrane, but we don't agree. The membrane (the thin skin on the bone side of the rack) is a tough barrier that needs to go. By removing the membrane, your ribs will be more tender and you will be able to get more flavor into the meat. To remove the membrane from the rack, take a blunt knife (like a butter or table knife) and slip it under the membrane along the end bone. Move the knife around a little to loosen the membrane so you can get a good grip on it. The membrane is a slippery skin, so grab it with a paper towel and you shouldn't have any trouble lifting it right off. With a little practice, you will be doing this so quick and easily that you won't think twice about it. With the membrane off, inspect the rack and remove any loose meat. This will only dry out on the grill so you don't want it on there. What you want is a good, clean rack of ribs that is square and even. If you are using spareribs you might need to do a little more trimming. A good rack of ribs deserves a good rub. Applying a spice mixture to the surface of the ribs is going to put a lot of flavor into the meat and prepares the surface for a light crust. Use your favorite rib rub. Spread the rub on the ribs generously. The amount that sticks is the amount you need, so let the ribs decide how much rub they get. Sprinkle the rub over the entire surface of the ribs, back, and front, as well as the edges around the rack. You can put the rub on the ribs in advance to let the flavor sink in, but don't do it too early. The rub is dry and isn't going to magically melt into the meat much more than the surface. Also, if you put the rub on too early, the spices tend to "cure" the surface a little and give the ribs a ham-like flavor. Now it's time to turn your charcoal grill into a smoker. This is easily done with two disposable aluminum pans. They should be about half the size of your charcoal grill. One of these pans will act as a drip pan that helps hold the charcoal in place and keeps drippings away from the fire. The other pan will be filled with water to add moisture to your grill and to help regulate the temperature. Start with a clean charcoal grill. Remove the cooking grate and start the charcoal. We're using a charcoal chimney which will light the perfect amount of charcoal. You will need enough charcoal to cover half the coal grate with three layers of charcoal. Once the charcoal is lit, place one of the aluminum pans on the coal grate and pour the charcoal on the other side. You might need to bend the pan a little to fit it properly. Now, it's time to add the wood. The wood is important for creating the smoke. We suggest large wood chunks since it will take longer to burn and provide smoke as you need it. Use several chunks for a good smoke supply. Return the cooking grate and place the second aluminum pan on it, directly over the charcoal. Fill with as much water as it can hold. The goal is to keep the grill at a consistent and low temperature (around 250 F/120 C). The water will steam away slowly and you shouldn't need to add more water, but keep an eye on it. Now you have converted your grill into a smoker. With the grill set up for smoking, we can add the ribs. At most, you will probably be able to fit two racks of baby back ribs or one rack of spareribs. Alternatively, you can buy a rib holder that props up the ribs so they stand on end so that you can fit more ribs at a time. Of course, this really depends on the size and type of charcoal grill you are using. What is important is that the ribs are not set on top of each other. It is important to expose as much of the surface of the rack to heat and smoke as possible. At this temperature, it is going to take about 3 to 4 hours to cook the ribs completely. We are looking for a final temperature of around 180 F to 185 F/80 C to 85 C. This is the point of maximum tenderness before the meat starts falling off the bone. Remember that great ribs have bones in them and don't fall into a pile of meat when cooked. That whole "falling off the bone" thing was created by bad restaurants that boil ribs. Place the rack(s) of ribs on the cooking grate of the grill, rib side down, next to the water pan. 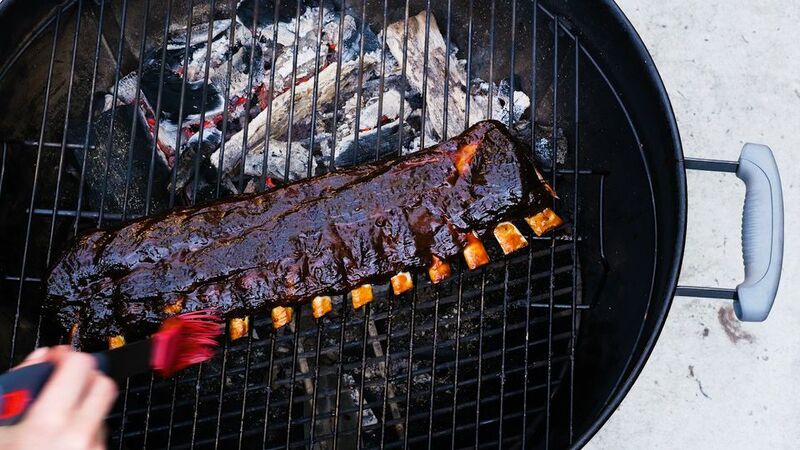 No part of the ribs should be directly over the fire. We will turn the ribs in a little while to provide for even cooking. The amount of time that this process is going to take really depends on the charcoal grill you are using and the outside temperature. After about an hour, check on the ribs. This is also a good time to make sure the grill has enough fuel and that the water pan still has enough water in it. Add some additional wood chunks to the fire. Rotate the ribs to help them cook evenly. The meat should still be soft and the surface browning. After about another hour, wrap the ribs in a double layer of aluminum foil. This holds in moisture and brings the internal temperature up. When you pick up the ribs they should curve nicely, but not fold. Place the wrapped ribs back on the grill, checking the fire and the water pan. There is no need to add additional wood chunks at this time. The ribs have absorbed all the smoke they are going to get. Allow the ribs to continue cooking for another hour. Now we get to the final phase of our barbecue ribs on a charcoal grill. After about an hour, remove the foil and return to the grill for 30 minutes to an hour. This final turn on the grill is going to give the ribs a drier surface so that you get some texture out of the bite. What you want to look for is how well-cooked the ribs are. For this, use a meat thermometer (look for a temperature of around 180 F to 190 F.). Unfortunately, with ribs, this can be a challenge. The bone will be a different temperature from the meat and to get an accurate read you will need to check the meat without getting the thermometer too close to the bone. Another way to check for doneness is to lift the ribs in the middle. If the ends droop loosely down from the middle, the ribs are done. This is an old pitmaster trick and if you keep it in mind when cooking ribs, you will get the hang of it and be able to tell when ribs are done by using this technique. You can remove the ribs at this point, but if you want to add barbecue sauce, read on. When the ribs are nearly done, it is time to slather on the barbecue sauce (if you intend to sauce your ribs). This should be done in thin layers. By layering on the sauce, you get a sticky surface on the ribs and not a thick wet coating. Start by putting a layer on the ribs and turning them over and coating the other side. Close the lid on your grill for about 5 minutes and repeat. We generally do this about five times to give the ribs a thick coating. Once done it is best to serve right away but they can be held to eat later if necessary. If you are not going to be enjoying these ribs right away or need to hold them for a while before serving, remove the rack of ribs from the grill and place on a cutting board for about 10 minutes to let the surface cool and the sauce to dry slightly. Then wrap tightly in several layers of plastic wrap. Barbecue sauces can be acidic and react with aluminum foil. If you are going to be enjoying these much later, then wrap in a single layer of foil and refrigerate. If you need to hold them at temperature for up to an hour, wrap the rack in a heavy towel and set aside. To reheat a rack of ribs later, unwrap the ribs and place in a large glass dish and cover the dish with foil. Place in a preheated oven at 250 F for about 1 hour. Reheated ribs will generally be a bit dryer then right out of the smoker. Apply a little more barbecue sauce to compensate. Carving ribs is best done with a long sharp knife and a pair of tongs. Place the rack of ribs on a large cutting board and set them on end, exposed bone end up. The trick is to slide the knife down, between the bones evenly. If you look at the rack from the bone side you should be able to see the path of the bone a little easier. By cutting straight down through the rack you can get a good, even cut and a uniform rib. Rib bones tend to turn a little more towards the small end, but with a little practice, you will get the hang of it. By the time the ribs are cut, they will be sufficiently rested for eating so this should be the last thing you do before serving the ribs.